Ayurveda meaning “knowledge for long life” is a system of traditional medicine native to India. The practice of Ayurvedic medicine is thousands of years old and stresses the use of plant-based medicines and treatments to promote a healthy and balanced body and mind. 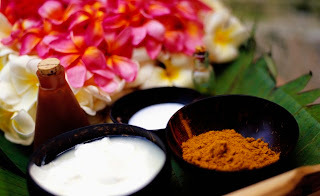 Ayurvedic hair care involves the use of natural, herbs, powders, oils and techniques to promote hair health, growth, thickness and length. It’s a holistic approach to hair care as Indians believe that the health of the hair, skin, and nails is a good indication of the overall health of the person. A basic Ayurvedic regimen involves regular oiling of the hair and massaging the scalp using a variety of herbs depending on specific need. The herbs are often found in powdered form and used either as a topically applied paste or rinse. The herbs can be categorised into two functions: cleansing or conditioning. Whilst I don’t follow an Ayurvedic regimen per se, I do incorporate a few of the herbs into my regimen. I regularly use a mix of Henna/Cassia, Neem and Amla powder as a conditioner and I always pre-oil my hair before a wash with either coconut oil or some other oil based mix.